Simona Halep defeated both Ashleigh Barty and Lesia Tsurenko to reach the semi-finals of the Cincinnati Masters on Friday, but Elina Svitolina was unable to follow her example, as she lost to Kiki Bertens. After rain in Ohio on Thursday curtailed the schedule of the WTA Premier 5 event, world number one Halep, fifth seed Svitolina and the in-form Bertens were required to play two matches to make up for lost time. Halep successfully navigated her assignments to close in on another appearance in the final, but Ukrainian Svitolina came up short against Bertens. Also on Friday, Petra Kvitova won a marathon encounter with fellow seed Elise Mertens, and Aryna Sabalenka ousted Madison Keys. Wimbledon champion Halep, a beaten finalist in Cincinnati in 2015 and 2017, defeated Barty 7-5 6-4 before finding herself in trouble early in her match against Tsurenko. The Romanian recovered from 1-4 down in the first set to win 6-4 6-1 and breeze into the last four, where she will face Sabalenka. Svitolina matched the efforts of Halep in winning her delayed encounter with Amanda Anisimova in straight sets. But the world number seven then found herself vulnerable up against Bertens, the Dutchwoman – ranked just 10 places below her opponent – taking advantage to win 6-4 6-3. 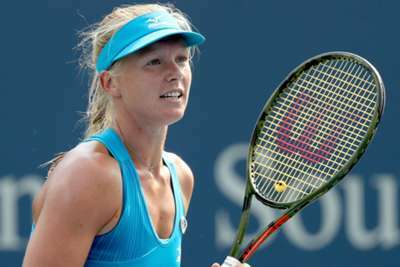 Bertens prevailed despite her own postponed encounter with Anett Kontaveit having earlier gone the distance. Bertens' opponent in the last-four will be Kvitova, the eighth seed having battled past Mertens (15) to win 7-5 5-7 6-3. The Czech, who defeated Serena Williams in the second round, had to recover from going a break down in the deciding set, before ultimately prevailing after a gruelling two hours and 44 minutes.